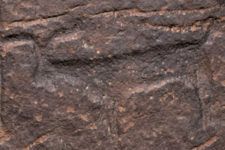 Goats are one of the world’s oldest domesticated animals, having been brought under human control more than 10,000 years ago. They have been kept for their milk, meat, and hair throughout history. Approximately 2.2 millions goats live in Saudi Arabia. There are several goat breeds in Arabia currently, including the Harri, Ardi, Habsi, Masri, Hejazi, and Najd breeds. The Najd goat is the most prized breed in the region today. They have long, silky hair and a high nose bridge. The Hejazi, bred primarily for meat, has enormous ears that can reach 70 cm in length and 25 cm in width. 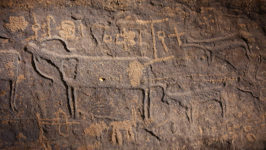 The few goats depicted in Saudi rock art appear to be very generic, with no notable features. 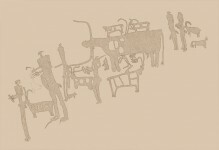 It depicts a herding scene with a a bull, sheep, and goats being herded by men and dogs.